How closely is human health linked to ocean plastic pollution? “Do a conference on oceans and human health”, said a good friend of mine to me a couple of years ago. “That’ll get people’s attention” he said, referring to the overall pollution crisis the world’s oceans face, which he and I care quite a lot about. We were discussing what it would take to drive more business interest in the subject. His point was that most people only really care about the environment when it directly affects them. Or, to be more nuanced, is visible and inescapable. Look at climate change. It hasn’t yet affected most of our lives in a really significant way (unless you live on a low lying pacific island or are a rare/vulnerable species expert) but we’re starting to see its impacts around us. So, a couple of years after my friend’s suggestion, we’ve tweaked his idea to make it about ocean plastics pollution, and we’re running a debate/science/solutions based conference called: “How business can tackle ocean plastic pollution” on 26-27 October in London. We’ve had lots of big companies, key NGOs and others sign up already, so that’s nice. Join us if you can. Back to the title of this post, in our research for the conference, we came across this document by the Netherlands-based Plastic Soup Foundation. In 2013, scientists at the Plymouth Marine Laboratory in England filmed plankton, the base of the food chain, consuming plastic. Researchers at the University of Lund (Sweden) have demonstrated that nanoplastics can move through the food chain and affect the animals at the top it. Microplastics are found in 63% of the prawns in the North Sea. Japanese oysters filter microplastics out of the water, the consequences of which are fertility problems and deformed offspring. Italian research shows that the consumption of polyvinyl chloride (PVC) can damage the intestines of sea bass. American scientists have discovered that microplastics can cause liver cancer in fish kept under laboratory conditions. 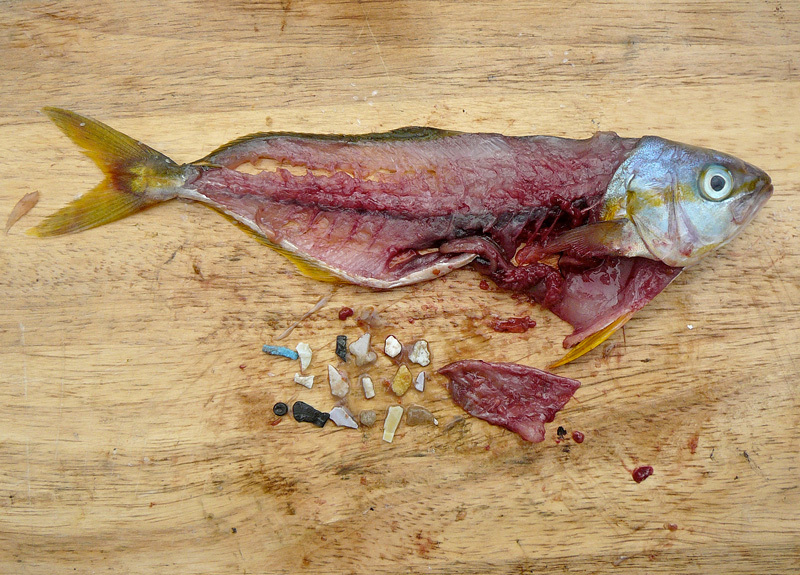 A quarter of the fish bought at local fish markets has plastic in their digestive tracts. Scientists concluded this from researching fish from fish markets in Indonesia and California. Plastic contains several added chemicals, including hormone disruptors. What damage do these chemical substances cause and/or what are the physical consequences? Plastic can be a carrier of viruses and parasites. What is this doing to our bodies? Now, I’m not a scientist. Nor am I someone who takes everything they see from campaigning NGOs at face value, but you can see where I’m going here. I suspect the answer to my question in the title “How closely is human health linked to the oceans?” is probably “quite a lot”, if you consider the health of fish populations, which after all, according to the UN, are vital to nearly half the world’s population: “Oceans serve as the world’s largest source of protein, with more than 3 billion people depending on the oceans as their primary source of protein“. Of course, if the studies cited above, particularly that carried out by the Berlaymont Declaration signatory scientists, are right, we’ve got another big, related, problem on our hands, which is a chemicals-related hormone disruption/health crisis looming somewhere in the near future. I’ve published and edited a number of articles on the dangers of chemicals (or the exaggeration of the dangers) in the last fifteen years, and I know it’s a minefield of an area. One study will show one thing, another, the opposite. “For many endocrine disrupting effects, internationally agreed and validated test methods do not exist, although scientific tools and laboratory methods are available. That’s not good, and surely needs addressing. We do know that in general, consumers are not comfortable knowing that Persistent Organic Pollutants or flame retardants or glyphosate are prevalent in the environment or our bodies. We’ll find out eventually, I suppose, just how damaging these things are. To save you reading time, what’s sobering is essentially a repetition of what’s posted above in terms of potential health risks. So what are the conclusions from a 50 year review of the dangers of plastics in the oceans to human health from his work? So we don’t really know for sure, but we know it’s not good. That’s my answer to the question that serves at the title of this post. Is that good enough? It is when it comes to climate change, for example. The infographic I found and have posted below has one statistic in it that on its own ought to be enough for us to focus on cleaning up the oceans. That stat? “70% of the oxygen we breathe is produced by marine plants”. My conclusion is that ocean plastics are a crisis we can see, and perhaps we can do something about. It should lead us to tackle the bigger crisis of overall ocean health, which is clearly linked to human well-being, and doing so may be a useful first step in that direction. The concern of course is spending too much time on one issue (oceans plastics), to the detriment of something more significant (say, ocean acidification and climate change). As to the human health impacts, we’ll be discussing those in more detail on October 26-27 in London, I hope you can come along and join the dialogue. Jul 25, 2017 | Posted by Toby Webb in CSR and Sustainability, NGOs, Oceans, Seafood and Aquaculture, Stakeholders, Supply Chain | Comments Off on How closely is human health linked to ocean plastic pollution?